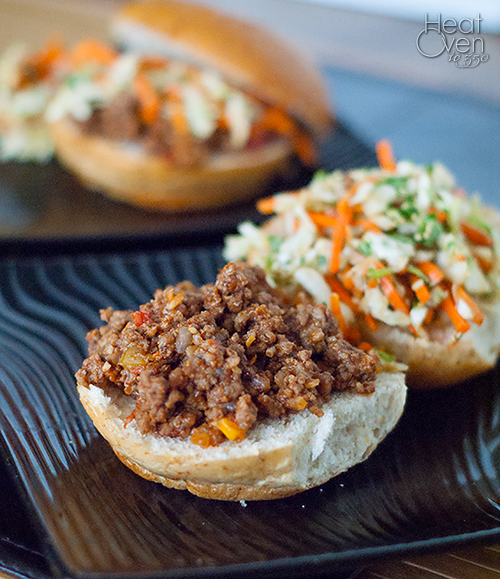 There are so many reasons why I love these sweet and sour sloppy joes. First of all, I'm a fan of sloppy joes in general. Saucy meat on a freshly cut bun? Delicious. Second of all, the sweet in this recipe comes from maple syrup. As any good former Vermonter, I love maple syrup in just about everything. It has the most amazing, distinct sweet flavor. (I'm talking about real maple syrup here, not the Aunt Jemima stuff.) Thirdly, the sesame ginger slaw that goes on top of these joes is heavenly all by itself, but especially good with the sweet, tangy, spicy meat sauce. 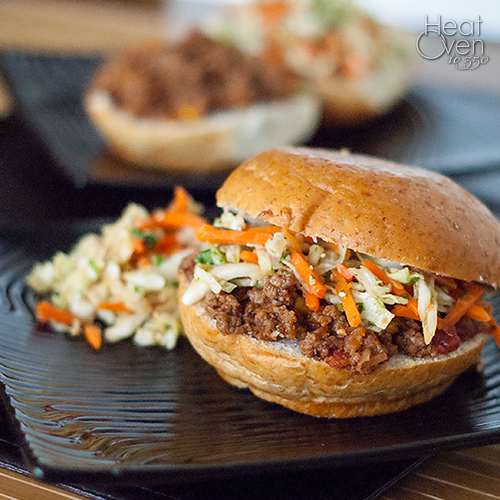 It's a happy combination of flavors that make this Asian take on sloppy joes as delicious as the original. Despite the long list of ingredients, the joes and the slaw are quick to put together and easy as well, making this a weeknight meal that you'll come back to again and again. In a large skillet, brown ground beef or turkey and chopped garlic over medium heat until the meat is no longer pink. Add garlic and cook and stir an additional minute. Stir in the maple syrup, vinegar and salsa. Lower the heat to low and cook, uncovered, for 20 minutes, stirring occasionally. While meat is simmering, make the slaw. Combine the coleslaw mix, carrots, green onion, cilantro and sesame seeds in a large bowl. In a small bowl, stir together sesame oil, olive oil, soy sauce, vinegar, honey, ginger and lemon juice. Add dressing ingredients to coleslaw mix and stir to mix. Let stand 10 minutes. Taste and add more soy sauce or salt to taste if needed. When meat has finished simmering, serve over hamburger buns. Top with sesame ginger slaw. These look great! So glad to see you back. I know how hard it can be to write when you're going through kid-related stuff. I'm looking forward to more recipes like this!